Der grüne Bereich is where I put ran­dom thoughts, notes, sketches and mostly pho­tos from my stay in Ber­lin. I used a tem­plate called Min­in­at­ica, mod­i­fied to suit my needs. At the bot­tom of the page I’ve added a fairly big sec­tion with news, recent com­ments list and oth­er non-essen­tial info. If you have javas­cripts enabled in your browser — you prob­ably have — this sec­tion is hid­den by default. Click­ing on ‘More info’ toggles its vis­ib­il­ity. This set­ting is saved in a cook­ie to make it per­sist­ent. After the foot­er info sec­tion, there is the main nav­ig­a­tion bar: from there you can choose to browse cat­egor­ies of con­tent like A day in the life, the ‘journ­al’ part of the site, or Pho­to­book, the pic­ture gal­ler­ies. You can reach as well pages like this one or go to my old site S M F G.
One fea­ture I was really miss­ing from the ori­gin­al tem­plate is the abil­ity to nav­ig­ate through posts without hav­ing to click on the back but­ton, so I added the ‘next’ and ‘prev’ links. Once you are in a post page, you can move to the next or pre­ced­ing one click­ing on the arrows at the far left and right just under the title head­er(1)(2). I spent a good three months pain­fully craft­ing pixel per pixel a new web site, after my two-year-and-two-months-long counter-clock­wise trip around the World. The idea was to have a reg­u­lar web­log sec­tion, with little to zero pho­tos, and a graph­ic­ally dif­fer­ent media sec­tion, show­cas­ing my pic­tures. For those who know me, it would have been com­pletely em based, and with a rig­or­ous ver­tic­al tempo as well as a hori­zont­al grid. Actu­ally most of the time was spent try­ing to make Fire­fox, Opera and Chrome — under both GNU/Linux and MS Win­dows — behave the same with the sub-pixel approx­im­a­tions(3). As even­tu­ally I real­ised, it was a too ambi­tious pro­ject, and I star­ted com­pletely in the wrong way: try­ing to modi­fy a tem­plate to suit my needs. I left the pro­ject when — instead of leav­ing for a new trip — I star­ted work­ing again as an archi­tect, in Janu­ary 2011. In autumn 2011 I moved to Ber­lin, and I imme­di­ately felt the urge to wander the inter­webs again. Unfor­tu­nately, the lack of an Inter­net con­nec­tion in the flat I am rent­ing(4) made the whole oper­a­tion quite tedi­ous. For these reas­ons, and for the lack of time, I went for a nice tem­plate and made a few lots of modi­fic­a­tions, not­ably the one-column-centered lay­out. I am pulling the fonts you are see­ing (the beau­ti­ful “Deli­cious” fam­ily by Jos Buivenga—except for the “bold-ital­ic” that I wouldn’t be using in any case — , and the hap­pily baroque(5) “Mutlu Orna­ment­al” by Gazoz) from my own serv­er, and this is the reas­on for that annoy­ing delay when you open a new page. Actu­ally after the first time they should be cached in your com­puter, so the page would load faster, but your mileage may vary(6). But before everything else I needed a devel­op­ing envir­on­ment. So I have installed in my tiny teeny net­book (yes, the same little baby that went all around the world with me) Apache, MySQL, PHP and Word­Press. Yes, I am run­ning a web serv­er and a data­base in my 4 years old net­book. The per­form­ance is — for so to speak — sub-optim­al, but I am pretty happy with the res­ult. So I was cod­ing in my kit­chen, then going by bike to the district’s lib­rary, and there upload­ing (and as much as pos­sible also test­ing) the last ver­sion of the web site. Just to tell you that I have your “Lord of the Flies” copy. I think I found it in the Hostel Inn (Iguazu, Argen­tina), but I am not sure, I just noted the web­site now in 2012 (!). Well, I do the same kind of stuff to my guide­books, some of them star­ted in South East Asia and are now in the hands of a good lad from Dubai. 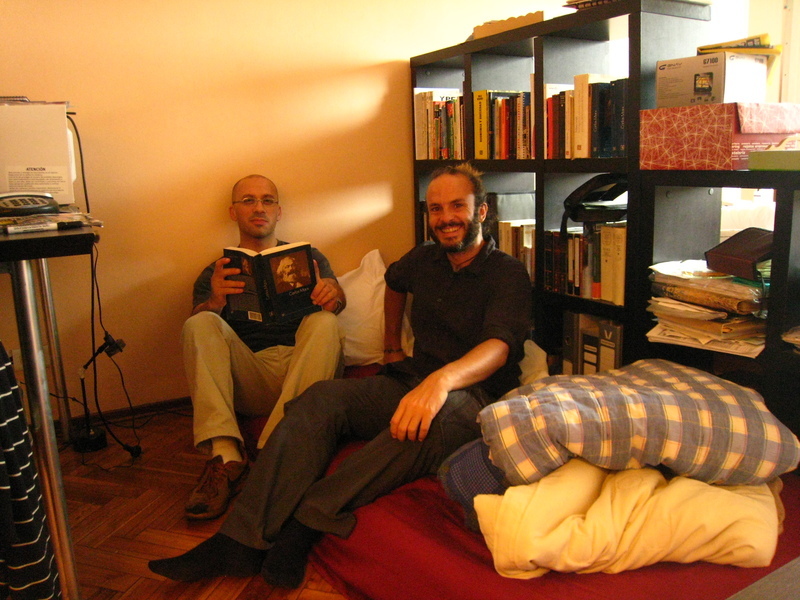 So your book has been read and hap­pily sits in my place in Buenos Aires. Cheers from Argen­tina. Ok, here we have “some­thing”: I don’t know who is Joanne East­on, but if you are here it means that you read the same book I bought in a second hand book store in Broome, Aus­tralia, and left in a hostel room in Rotorua, New Zea­l­and, after writ­ing, as usu­al, my email and web address on the first page. So far so good. You are the first one to actu­ally write me back. But, of all the coin­cid­ences in this world, can it be that my book hap­pily sits in this place in Buenos Aires?